Zlatan Ibrahimovic has rejoined Manchester United on a one-year contract after the Swedish star's spell with the EPL side was curtailed by a serious knee injury last season. Manchester United's Zlatan Ibrahimovic celebrates after scoring against Southampton in the English League Cup final at Wembley Dtadium in London in this February 26, 2017, photo. The Sweden striker has signed a new one-year deal with United. Zlatan Ibrahimovic has rejoined Manchester United on a one-year contract after the Swedish star's spell with the English Premier League side was curtailed by a serious knee injury last season. Ibrahimovic has been working with United's medical staff at the club's Carrington training base and his regime has been so successful that reports suggest he could be back on the pitch by late October. Despite Ibrahimovic's encouraging recovery, which included the Swede being pictured diving off the side of a luxury yacht recently, the United boss won't rush his return. "We are delighted Zlatan is on the road to recovery and we are equally delighted to have his ambition and experience back with us," Mourinho said. "After his contribution last season he deserves our trust and we will be patiently waiting for him to return. 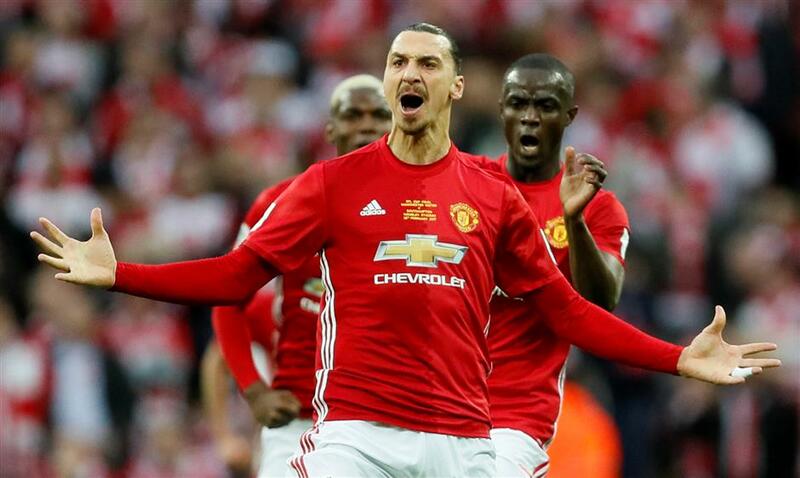 In Ibrahimovic's absence, United has made a flying start to the EPL season. Mourinho spent a British record 75 million pounds (US$96.12 million) to sign Everton striker Romelu Lukaku in the close-season and the Belgian's arrival has sparked United to win 4-0 against both West Ham United and Swansea City in its first two league games.